“‘SATRANGI'” — The 7th Version Of Atrangi Is Out Here. 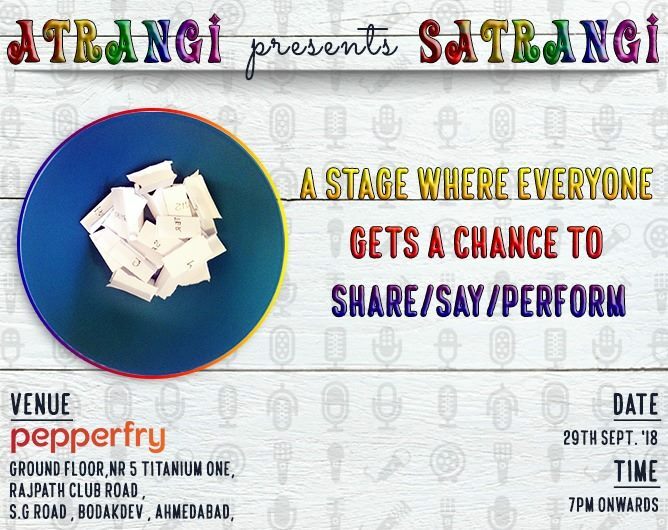 An Open Stage Where Anyone Can Share Anything You Wish To, Be It Comedy, Storytelling, Poetry, Music Or Even If You Just Want To Talk To People. Inviting Everyone Who Likes To Speak On MIC. We Assure You To Have Max. No. Performances This Time & An Amazing Experience. There Would No Prior Selection For This Event, Performances Will Be Decided On The Basis Of Lucky Draw. So Bring Your Material & Some Good Luck. Looking Forward To Most Enjoyable Event With All Of Your Presence.